The main washroom is the new home for all such things, therefore it needed some organization. The bobby pin idea was one of the first things I ever pinned on pinterest, and what a great idea it is! For only a $4 adhesive magnetic strip from the dollar store stuck to the back of the cabinet door, it is the perfect solution. 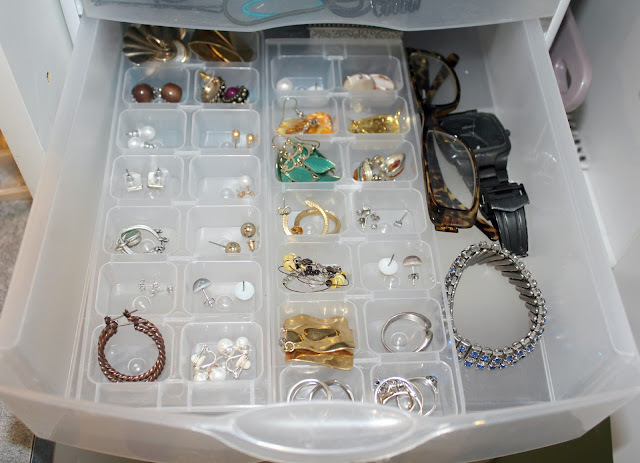 The ice cube tray took some "earring organization" searching on pinterest. I love how each earring set is individually seperated for easy access that requires no digging around in a dark bottomless bag! The trays can also hold other small items such as rings or pendants. I used 4 trays stacked 2 and 2 but took the top two off for the purpose of the photo. 2012 TwoPennysandaLoonie. Simple theme. Theme images by andynwt. Powered by Blogger.